With his ``Kinetic Theory of Gases'' Boltzmann undertook to explain the properties of dilute gases by analysing the elementary collision processes between pairs of molecules. The evolution of the distribution density in space, , is described by Boltzmann's transport equation. A thorough treatment of this beautiful achievement is beyond the scope of our discussion. But we may sketch the basic ideas used in its derivation. To gather the meaning of equation 2.2 for free flow, consider the collisionless, free flow of gas particles through a thin pipe: there is no force (i. e. no change of velocities), and -space has only two dimensions, and (see Figure 2.2). (this would engender an additional vertical flow in the figure), and to six instead of two dimensions (see equ. 2.2). All this is for collisionless flow only. - velocity and position of a molecule are uncorrelated (assumption of molecular chaos). ( thus denotes the relative orientation of the vectors and ). The function depends on the intermolecular potential and may be either calculated or measured. where , etc. This integrodifferential equation describes, under the given assumptions, the spatio-temporal behaviour of a dilute gas. Given some initial density in -space the solution function tells us how this density changes over time. Since has up to six arguments it is difficult to visualize; but there are certain moments of which represent measurable averages such as the local particle density in 3D space, whose temporal change can thus be computed. Chapman and Enskog developed a general procedure for the approximate solution of Boltzmann's equation. For certain simple model systems such as hard spheres their method produces predictions for (or its moments) which may be tested in computer simulations. Another more modern approach to the numerical solution of the transport equation is the ``Lattice Boltzmann'' method in which the continuous variables and are restricted to a set of discrete values; the time change of these values is then described by a modified transport equation which lends itself to fast computation. where is the (Maxwell-Boltzmann) distribution density of particle velocities, and denotes the Heaviside function. The subsequent expansion of the gas into the entire accessible volume, and thus the approach to the stationary final state (= equilibrium state) in which the particles are evenly distributed over the volume may be seen in the solution of Boltzmann's equation. Thus the greatest importance of this equation is its ability to describe also non-equilibrium processes. It is also the limiting distribution for long times, . where and are the local density and temperature, respectively. 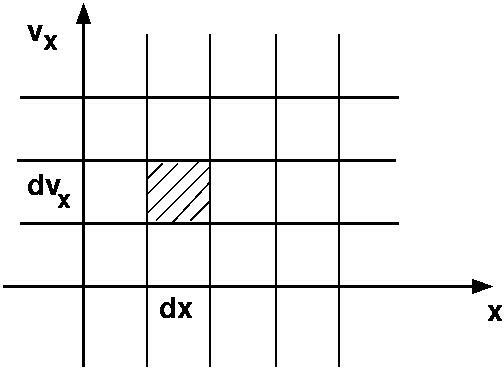 This is the famous Boltzmann distribution; it may be derived also in different ways, without requiring the explicit solution of the transport equation. See next section, equ.2.30.